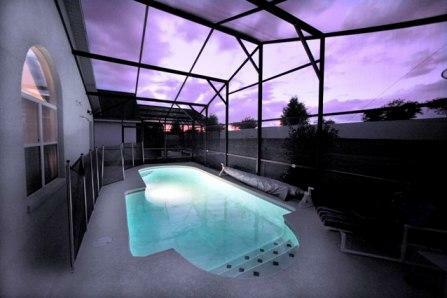 Outstanding three bedroom villa with its own private pool and games room situated on the much requested Legacy Park. From the moment you walk through the door you realise how delightful this villa is. The quality of the furnishings and decor are excellent. Bonner Villa has three terrific bedrooms with the master having its own large bathroom with walk in shower and bath. The entrance way opens into the large family room and dining area framed by sliding doors leading on to the pool deck. This villa boasts an exceptional open plan living space with big comfy sofas. Make yourself at home with the large flat screen TV or chill out listening to the stereo. There are TVs in every bedroom and there is free high speed internet to keep you connected. 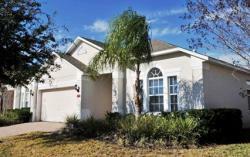 This villa also has free local and long distance call within the USA. The wow factor continues with an excellent games room to tire the kids out after a day in the parks. The games room consists of a pool table, darts board, basketball and air hockey table. If this were not enough there is a games console too. The modern kitchen is fully equipped with all the appliances that you need to give you total eating flexibility with fridge, oven, microwave and dishwasher. The pool deck is not overlooked to the rear and has with sun beds and table and chairs for a little outdoor eating. The pool does have an optional heater which can be activated at an extra cost. Legacy Park is conveniently located close to a large Wal Mart supermarket and the 4 miles of restaurants, bars and takeouts along Hwy192.